New All-in-One Wetroom Kits to Launch in May 2015. Living Spaces All-in-One wetroom kits have been designed for wetrooms and walk in showers, providing a tileable shower base, avoiding the need for the traditional ‘step-in’ white acrylic tray. It is a highly cost-effective solution with everything needed to complete a great job. Included in the kit is the aqua dec, the fast-flow drain and the waterproofing/tanking kit. PRODUCT DETAILS — All-in-One WETROOM KIT. A full range of sizes available, trimmable by 50mm. Square and Linear dec options too. Centre or Offset Drain available too, so please specify. Fast Flow Drain Kit INCLUDED. Strong & Light weight — 20mm thick. Pre Made 2% fall to drain. Can be used on Timber or Concrete flooring. Full detailed instructions available. Cement based surface that be tiled direct to. Easy to install and excellent fitting instructions available. OFFSET DRAIN position allows for the easier avoidance of flooring joists. CENTRE DRAIN positions are uniform in appearance offering an easy tiling option that an offset drain. NB: If you have a concrete floor or if there isn o access under the flooring to locate the shower drain, then the tray canstill be used by using a separate raised substrate. 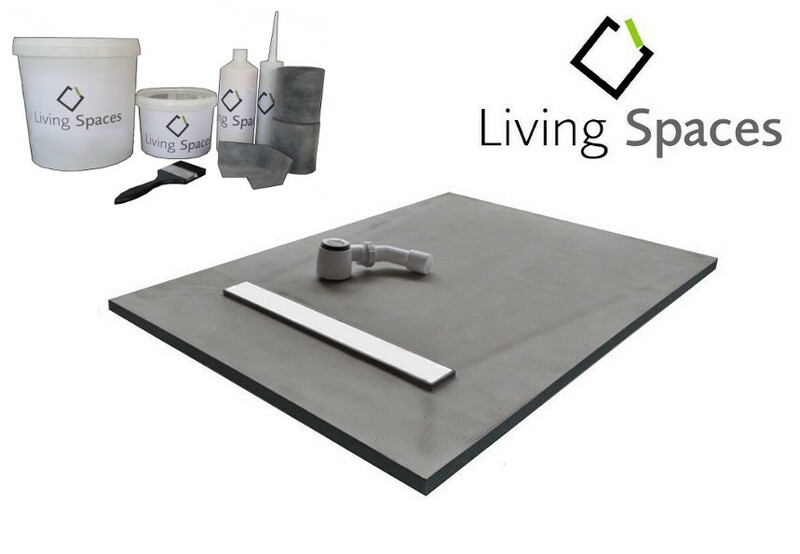 Paintable tanking membrane which is ready-mixed, under-tile tanking system toprotect water sensitive substrates from exposure to water. The kit is complete with acrylic primer, waterproof membrane paint, waterproof tape, gloves& brush. Designed to protect walls and floors that are sensitive to water in humid areassuch as sanitary blocks, showers and kitchens. If you have any questions or are unhappy with the product please email us and let us know we will be only to pleased to try and rectify any issues that you may have.